The 1st century AD inscription which has recently been discovered printed (most likely, by accident) on an ancient vessel in an Ancient Thracian burial mound near the town of Tatarevo in Southern Bulgaria has been found out to be a verse from the poem “Prayer to the Muses" by Ancient Greek poet and statesman Solon. The inscription, which was printed on a clay vessel, was found in August 2015 by the archaeologists excavating a Thracian tumulus (burial mound) repeatedly targeted by treasure hunters in the town of Tatarevo, Parvomay Municipality, in Southern Bulgaria. The vessel with the “printed" inscription in Greek is a balsamarium (an ancient vessel for holding balsam). It was found by the tem of the Director of the Plovdiv Museum of Archaeology, Kostadin Kisyov, inside the fourth, and most likely main grave in the so called Great Ancient Thracian Mound in Tatarevo. 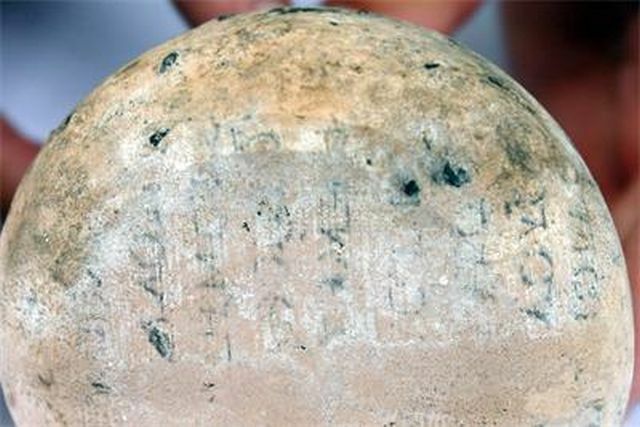 Because of the fact that ancient inscriptions on vessels are usually engraved while the one from the Tatarevo Mound appears to have been printed, with straight lines of letters, the Bulgarian archaeologists have figured out that the “printing" on the balsamarium was most likely accidental, and appeared after the vessel was wrapped in a parchment on which the actual text was written. 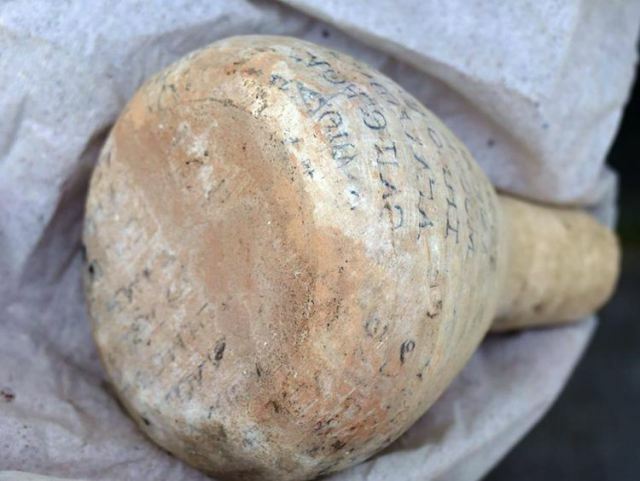 The Ancient Greek text on the balsamarium from the Great Ancient Thracian Mound in Bulgaria’s Tatarevo has now been deciphered, reports the 24 Chasa daily citing lead archaeologist Kostadin Kisyov. It appears to be part of a quote from the poem “Prayer to the Muses" by the glorious Athenian politician and poet Solon (ca. 638 – ca. 558 BC), who, among other things, is credited with laying the foundations of the democracy of Ancient Athens. “This is a unique find because it is the first time a parchment with the text of a literary work has ever been found in Bulgaria – and in a “negative" in which the letters are backwards," says lead archaeologist Kostadin Kostadinov. He concludes that the man who was buried in the fourth and deepest Ancient Thracian tomb in the Great Mound in Tatarevo, and in whose grave the archaeological team found the balsamarium with the printed inscription, was likely a spiritual figure. “Apparently, the buried [man] was not a warrior because there were no armaments or expensive decorations, which shows he was a spiritual figure. In the Antiquity, people like him were the most erudite," explains the archaeologist. Kisyov reminds that his team rescued in the last minute the Great Ancient Thracian Mound near Tatarevo from treasure hunters who had started to make tunnels into the mound in search for the Thracian tombs beneath. “The treasure hunters had dug up tunnels but, luckily, they had not reached the tombs. If they had robbed them, they would have sold this find (the balsamarium) for a lot of money," he points out. The Great Mound near Tatarevo has a diameter of 60 meters, it is 12 meters tall, and was covered with 26,000 cubic meters of soil. Because of the four graves found underneath the mound, Kisyov believes it was an Ancient Thracian family tomb. The man buried in Grave No. 4 underneath the Mound was cremated, and the grave had a meager inventory – a total of four clay vessels, including the balsamarium with the printed inscription, and an iron spear tip. “The parchment itself [that the balsamarium was wrapped in] has almost completely disintegrated. This technique [of writing] was used first in Ancient Egypt, and later spread to Ancient Greece and Rome," Kisyov notes. The archaeologist believes that the spiritual figure buried in the fourth grave of the Tatarevo Mound came from the Odrysians, the tribe that formed the most powerful Ancient Thracian state, the Odrysian Kingdom, and that he was a learned man who could read Solon’s poem written in Ancient Greek on the parchment found in his grave. “These works were sold in the Antiquity like books. The owner of this parchment acquired it because he liked what Solon had written," the archaeologist speculates. The balsamarium with the quote from Solon’s “Prayer to the Muses" will be restored, and will become part of the permanent collection of the Plovdiv Museum of Archaeology which has over 160,000 artifacts. The Thracian inscription printed on the balsamarium found in the Tatarevo Mound is the second Thracian inscription found in the region around the town of Parvomay in Southern Bulgaria. In 1912, an inscription was found on a gold ring (discovered in a Thracian burial mound) near the town of Ezerovo, which belonged to a Thracian aristocrat. The letters in the balsamarium inscription found in the Tatarevo Mound were written with ink made from cinder and natural dyes that left an imprint on the clay vessel. The inscription indicates that the local Thracians were literate. They used Greek instead of Latin letters even though by that time – the second half of 1st century AD – they were already part of the Roman Empire (Rome conquered all of Ancient Thrace south of the Danube in 46 AD, with the Thracian aristocracy generally becoming absorbed as Roman provincial aristocracy). In the northeast corner of the grave, the archaeologists have found funeral inventory consisting of 4 clay vessels and a small iron spear tip; these artifacts have been preserved because they were placed in the grave after the cremation. Another discovered artifact is a metal fragment from sole of a man’s sandal. 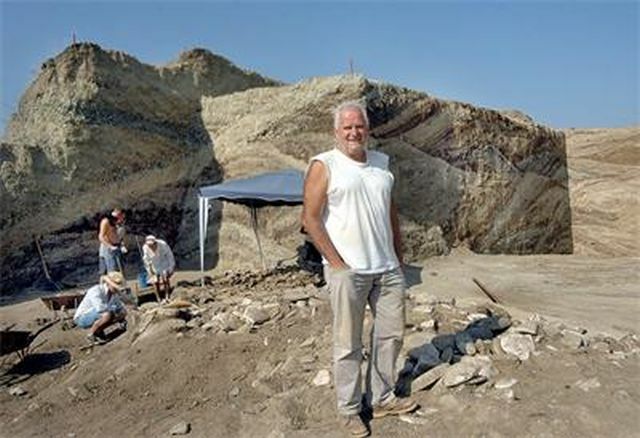 The excavation of the Ancient Thracian mound in Tatarevo is one of the not so many cases in which the Bulgarian archaeologists have managed to beat the ruthless treasure hunters looting the country’s thousands of archaeological sites, after Plovdiv Municipality provided emergency funding for the excavations, and after the Thracian tumuli in Tatarevo were targeted by treasure hunters as recently as June 2015. Back in 2013, through emergency excavations, Kisyov managed to save from treasure hunters six Thracian funerals found under the so called Pamuk Mogila mound in the town of Brestovitsa where the most impressive discovery was a very rare war helmet of a Thracian aristocrat from the 1st-2nd century AD, which was recently showcased for the first time, and, judging by the readership of ArchaeologyinBulgaria.com, generated global interest. Learn more about the Ancient Thracian burial mound known as Pamuk Mogila in the Background Infonotes below. The Ancient Thracian tumulus (burial mound) known as Pamuk Mogila near the town of Brestovitsa, Plovdiv District, in Southern Bulgaria, was excavated in emergency rescue excavations in 2013 since it had been targeted by treasure hunters. It was excavated by a team led by Kostadin Kisyov, Director of the Plovdiv Museum of Archaeology, after local treasure hunters had dug up a 13-meter tunnel into the burial mound in search of the graves inside, and Kisyov himself had been trying to find funding for five years. The emergency digs were funded by Plovdiv Municipality and Rodopi Municipality a total of BGN 50,000 (app. EUR 25,500). Luckily, the treasure hunters had not managed to find the graves inside the mound, and Kisyov and his team discovered them. The huge tumulus, which was 14 m tall and had a diameter of 70 m, harbored a total of six graves, including the grave of a Thracian aristocrat from the 1st-2nd century AD. The archaeologists discovered about 80 artifacts, including a golden ring, a silver ring, a bronze ring, a parade combat helmet, two iron swords, three spears, a bronze coin (an obol for Charon, the ferryman of Hades who, according to Ancient Thracian, Greek, and Roman mythology, carries the souls of the newly deceased across the rivers Styx and Acheron in the underworld), 4 glass balsamaria with essential oils, 4 clay vessels, 2 bronze hydria for water and wine, bronze phiales (pateras), two candelabra, among others. Kisyov believes that because of the proximity of the Pamuk Mogila mound to ancient Philipopolis (today’s Plovdiv) it might have been a tomb for an aristocratic family that ruled the city. The Ancient Thracians believed in afterlife and they placed a lot of personal belongings in the graves and tombs of their dead. If the insciption transfered, wouldn’t it be a mirror image? Yes, it is a mirror image.